Solid Wood. Timeless Style. Since 1899. Durham Furniture builds solid wood furniture distinguished by exceptional quality, award-winning design and enduring value. Durham's furniture is handcrafted from sustainably harvested maple, cherry and ash - no veneers, no particle board – just Nature’s own uniquely beautiful creation. 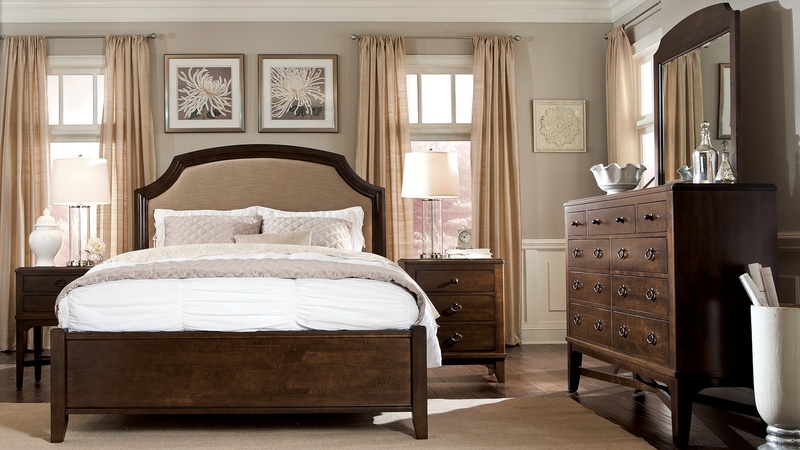 The Odyssey Collection made of solid maple wood with a metal base; includes both bedroom and occasional pieces that are available in more than 50 finishes. It is a great addition to an already extensive line up! Responding to consumer demand for casual and relaxed home furnishings, the 14-piece collection is characterized by its extremely distressed finishing techniques and will include pieces for the bedroom and living spaces. The collection is presented in two new distinctive finishes that effortlessly accentuate the depth and interest of the solid maple wood grain. Oyster is a light gray stain, while Cinder is a fresh clear brown. In addition to the new finishes, Prominence is also available in any of Durham’s more than 40 maple, non wire-brushed finishes. This minimalistic group combines a brushed stainless steel base with a solid wood construction. A sculptured, concave bar pull completes the case pieces, adding an architectural elegance. Offered in two exclusive finishes; Autumn Wind which is a subtle reflection of the warm autumn colors and Molten Night, a dark rich brown. An expansion of the Mount Vernon Collection with clean, simple lines. Crafted of solid maple in 4 compatible wire-brushed finishes, Trenton Grey, Whiskey, Aged Wheat and Latte. Mitered cases and inset beading on drawer fronts, accented with hand-driven nails. Casual antiqued ring pull hardware and key escutcheons. Drawers feature soft-close guides, some with cedar-bottom lower drawers. Side-tapered square legs and touches of fabric appeal to modern consumers. Four bed options. Meet Cascata, a bedroom collection to spark the imagination while soothing the soul. Just as the best of Italian design projects a sense of sophisitcation and style, Cascata is dramatic like a cascading waterfall, yet quielty urban in its structure. Drawing on a design balance between classic Italian elegance and modern creativity, the dramatic symmetrical curves of the concave drawer fronts and sides are defining design elements. Accented by minimalist nickel or antique bronze hardware, the flowing curves beautifully showcase the solid cherry woodgrains. With crisp geometric and urban-inspired details, Modern Simplicity appeals to Millennials who are ready to invest in beautifully designed solid wood furniture. Did you miss us in High Point? Please take a moment and tour our High Point Showroom during the April 2018 market.